There has been a church on this site going back at least one thousand years. Evidence for this lies in the south wall of the nave. There is a small narrow window set into a wall more than a metre thick. Outside, the construction is by “long and short” arrangement of squared stone blocks, typical of the late Saxon period (circa 900-1066). There was further development during the Norman period. Also on the south wall near the Chancel are two blocked doorways, one above the other, dating from the Norman period in the twelfth century. Furthermore the remains of a Norman arch were uncovered during the restoration of the Tower west wall in 2007. The main body of the church, however, dates from the mid-13th century. The steep pointed arch separating the nave from the belfry area and high curved arches dividing the nave from the north aisle are typical of many churches built at this time in the East Midlands. Late in the 13th century, the north aisle was added, perhaps originally as a chapel, the date being fixed approximately by the discovery of the lower half of a Crusader Cross set in the outside of the flint wall. This cross, together with the memory of the Order of the Templars, is preserved by the name 'Temple' in part of Great Wilbraham, and demonstrates the close links between the two villages and one of the Military Orders of the Crusading period. At this stage, the church probably had a flat roof, as indicated by the row of gargoyles set high up on the wall of both sides of the nave: the roof beams would probably have rested on these. 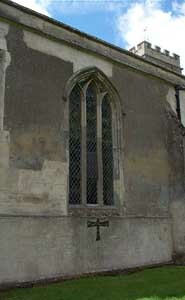 The porch also belongs to this period, with the Early English windows on either side. The fourteenth century saw major changes to the church. Early in the century, the square tower was added at the west end, strengthened by supporting abutments or flying arches. On the north side, the wall was reconstructed so that the top half of the Crusader cross was lost and new windows built into it. Near the end of the century, five ornate windows in English Decorated style were added. They dominate the east and west end of the church and also provide added light and beauty to the south side. In the fifteenth century, the south side of the chancel was reconstructed and a new set of windows in the Perpendicular Style inserted and the earlier 13th century arch between the nave and chancel replaced by one in the same style. The first known Rector was Walter, son of William, who lived circa 1230. The complete list of rectors [pdf] can be seen by clicking here. The Reformation and Elizabethan Settlement of 1559-1562 seems to have left parish life relatively undisturbed. Robert Buchle was priest 1539-1555, surviving the last years of Henry VIII’s reign, that of Edward VI (1547-1553) and the first years of Mary’s Catholic reaction (1553-1558). When he died in 1555, it was two years before a successor, John Byherdyle, was appointed. He successfully survived the transition between Mary and Elizabeth, dying in 1564. That year saw the arrival as Incumbent of Christopher Tye, doctor of music. An influential musician and conservative churchman of his period, Tye was the composer of a considerable number of motets and anthems. He had been a lay clerk at King's College, Cambridge, and subsequently master of the choristers and organist at Ely Cathedral from around 1543 until he took holy orders in 1561. During the Civil War (1642-1646) John Mundy remained at his post until his death in 1650, but there was a three year inter-regnum before his successor Isaac Dobson was appointed. The main addition of this period was the range of three bells. The eighteenth century saw no major changes to the church fabric, but the solid oak family pews appear to date from early in the nineteenth century. Around 1850, there were renovations and repairs especially to the 15th century roof and chancel. The lower and higher pulpits and the organ were also added. 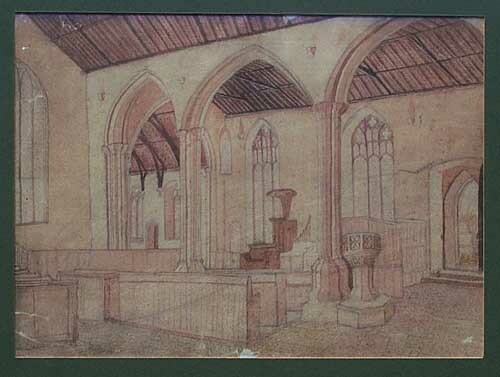 An old drawing, possibly dating from the late 19th century, shows how differently the nave was laid out. The pews faced each other in "collegiate" style; and the pulpit was adjacent to the south wall. The south door was hinged the opposite way to the present arrangement. The assumption is that it was changed in order to reduce the cold draught on the members of the congregation at the back of the church! Interestingly, there is no sign of the Saxon window. This must have been uncovered during later restoration work. The heavy oak cover to the font was bequeathed by legacy in 1960. There were substantial repairs to the roof in 1989-90 and to the tower in 2007. If you would like to learn more about the history of the Crusader Chapel of St. John's Church you can purchase a copy of the recent booklet, 'The Chapel of the Church of St John the Evangelist, Little Wilbraham' by J. Lane. For more information please email the Webmaster. All proceeds of sales go to the Parochial Church Council of Little Wilbraham to help it to support St. John's Church.